Protest at Twin Cites Pride: “No cops, no KKK, no racist Pride today!” | Fight Back! Minneapolis, MN - Tens of thousands lined Hennepin Avenue to watch the annual Twin Cities LGBTQ Pride parade on June 25. 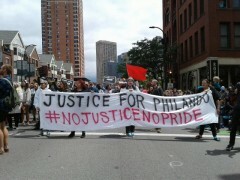 A group of hundreds behind a banner reading “Justice for Philando #NoJusticeNoPride” took the lead of the parade, a few blocks ahead of the police car that was supposed to lead the official parade. The group was protesting Pride’s decision to allow police to lead the parade and be present throughout the festival, despite an epidemic of police violence that particularly targets queer and trans people of color. Every few blocks, including at the main grandstand, the group would stop. At one stop, there was a dance party. Another time, organizer Austin Jackson spoke, “We’re going to take a moment of silence to be with yourself, or your queerness, or your blackness, or your transness and be here for the people who can’t be here today… and also for Philando, for Jamar Clark, for Marcus Golden, for Map Kong, for Phil Quinn, and every single person who has been murdered by police.” The marchers stood silent with their fists raised, and the powerful silence was honored by marchers and parade-watchers alike. At many of the stops, Kat George and June Kuoch read from a list of demands set out by protest organizers. First, “We demand that Twin Cities Pride honors the legacy and life of trans women of color and recognize Pride as the byproduct of their resistance of police brutality and repression.” Some of the other demands called for eliminating police involvement in Pride, and an end to white supremacy and other oppression within the LGBTQ community. The action took place in the context of longstanding conflicts within the LGBTQ community over racism and policing, which are heightened by the recent acquittal of the cop that shot and killed Philando Castile last year. Community pressure forced the issue, and on June 20, Pride organizers said there would be no uniformed police officers marching in the parade, and that more of the event security would be handled by unarmed security guards. Minneapolis police chief Janee Harteau was one of many area police officials that took to social media and the press to rail against the “divisive” move. Three days later the decision was reversed, and Pride announced that uniformed police would not be “excluded” from the parade, and instead, police were invited to carry the unity flags at the start of the march. Protesters delayed the parade by some 90 minutes, as they “reclaimed” the event, in the spirit of the Stonewall Rebellion. Many community members today are still living Stonewall, resisting police violence and repression now. The action was organized by an ad hoc coalition of groups and individuals, including Twin Cities Coalition for Justice for Jamar, Native Lives Matter, and Justice for Marcus Golden.